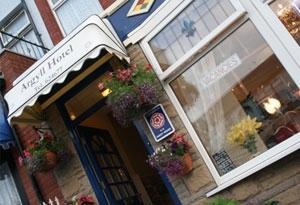 A warm welcome to The Argyll bed and breakfast in central Blackpool. Perfectly placed on Hornby Road, only a couple of minutes walk to the new shopping centre, Tower, Winter Gardens and Grand Theatre. It is perfect for guests attending one of the many conferences, concerts, British and International dance festivals, international darts, line dancing and the many other annual events that take place here. Please take the time to read some of our recent reviews on the right hand side of this page. A classic English breakfast is served between 8.30am-9.00am at individual tables in our spacious dining room consisting of juice, cereal, muesli or porridge,yogurt, cooked breakfast, tea or coffee, toast and preserves. We have a lounge overlooking the centre of Blackpool where you can relax with a choice of reading material, the television, or just talk about what your days activities will be. You can make a reservation using our online booking system, by telephone or by email. We will require a deposit (£10 per person non refundable) to secure your booking and we accept payment using credit and debit cards as well as cash and cheque. Hair dryers and ironing facilities available. Perfectly placed on Hornby Road, only a couple of minutes walk to the new shopping centre, Tower, Winter Gardens and Grand Theatre. Some on site parking available and various car parks close by. Please call us regarding parking spaces..